Not sure which custom album you need? 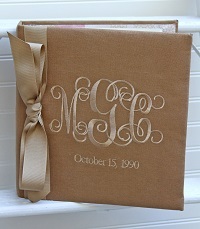 Check out for our photo album tutorial for about the different monogrammed photo albums we offer. Need a fabulous gift that will wow at your next baby shower bridal tea? 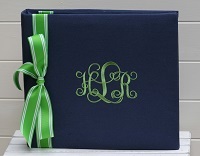 Our monogrammed photo albums are a best selling favorite. Personalized scrapbooks for new moms and baby are fun to design with our extensive options for fabrics, monogram styles and thread colors. Choose from a 4x6 photo book, a monogrammed scrapbook for weddings, baby books, honeymoon photos and anniversaries or any special occasion. These embroidered books come with a name or initials and are perfect for that upcoming wedding shower gift. The Pink Giraffe's selection of monogrammed baby gifts make gift giving easy!